The Society for Cultural Astronomy in the American Southwest (SCAAS) presents awards that showcase the best research and service in American Southwest cultural astronomy at its Conference on Archaeoastronomy in the American Southwest (CAASW). The purpose of the Society is to advance the study and practice of archaeoastronomy of the American Southwest in all its aspects, and by the granting of awards for excellence and/or initiative. The Society is committed to recognizing significant contributions to knowledge and the importance of research, professional standards and excellence in the study of archaeoastronomy, effective dissemination and presentation of archaeoastronomical knowledge, and innovation and originality of approach. Award nominations can be submitted to the Awards Committee at inquiry@scaas.org. The three categories are the Lifetime Achievement Award, the Distinguished Service Award, and the Distinguished Student Award. The 2014 Carol W. Ambruster Award and CAASW 2014 award for Distinguished Service in American Southwest Archaeoastronomy was presented to Park Ranger GB Cornucopia of Chaco Culture National Historical Park. GB Cornucopia has been a major figure on the National Park Service staff of Chaco Canyon for more than two decades, known both for his skill in explaining astronomy and archaeoastronomy to the public, and also in his engagement with researchers. Because of the excellence of his public presentations about astronomy, he can quite rightly be called the "Carl Sagan of Chaco." He has now become a major figure in the park with presentations at the Visitors Center, star parties and telescope viewing after the programs. Researchers in archaeoastronomy in the Canyon have benefited enormously by his advice, guidance and support in the field – GB was also a close friend to Carol Ambruster. The photo shows GB Cornucopia (center) receiving the award from Kim Malville (left) and Tony Hull (right). 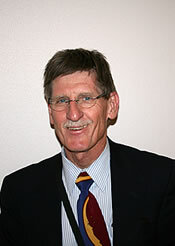 During the 2011 Conference at the University of New Mexico, the conference organizers presented Dr. E.C. 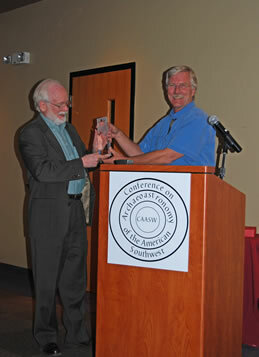 Krupp with the 2011 award for Distinguished Service in American Southwest Archaeoastronomy. E. C. Krupp, Ph.D., is an astronomer and the Director of the Griffith Observatory in Los Angeles. The award-winning author of In Search of Ancient Astronomies, Echoes of the Ancient Skies, Archaeoastronomy and the Roots of Science and Beyond the Blue Horizon, Dr. Krupp writes the popular "Rambling Through the Night Skies" column for Sky & Telescope magazine. 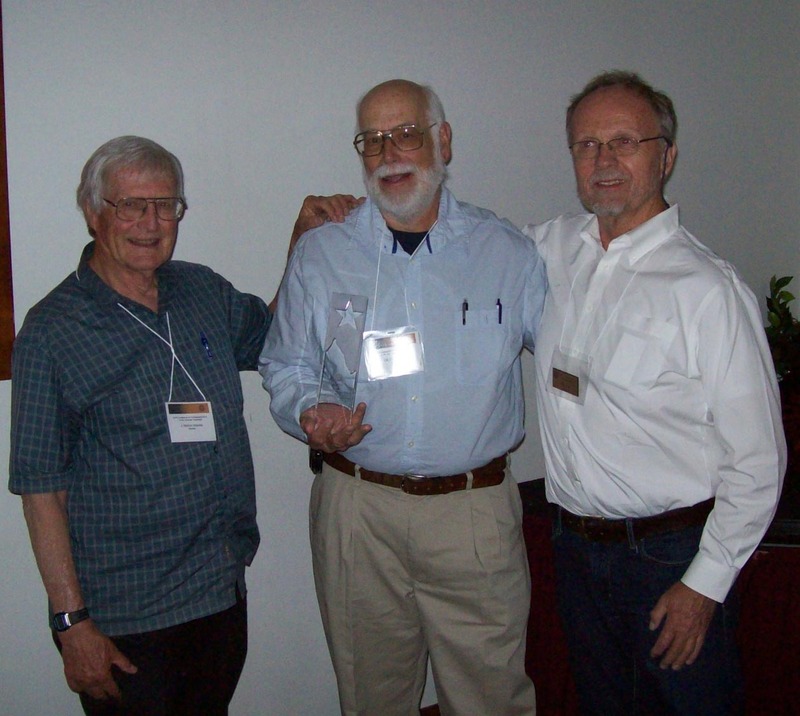 During the 2010 Archaeoastronomy in the Field Workshop, the conference organizers presented a Lifetime Achievement Award in archaeoastronomy research in the American Southwest to Dr. J. McKim (Kim) Malville, Emeritus Professor of Astronomy at University of Colorado-Boulder. Dr. Malville, who has been elected a Fellow of the American Association for the Advancement of Science for his work on solar physics, has been conducting archaeoastronomy research for more than 20 years and is the author of the book, A Guide to Prehistoric Astronomy in the Southwest (2008). A part of his ongoing mission to ensure that archaeoastronomy is conducted as a scientific endeaver, Dr. Malville presented a paper at the workshop titled "The Seven Deadly Sins of Archaeoastronomy." The photo shows Dr. Malville (right) receiving the award from Conference Co-Chair Dr. Todd Bostwick. This award is made in recognition of a scholar who has made distinguished contributions to archaeoastronomy of the American Southwest through his or her fieldwork, publications, teaching, and involvement in professional organizations. 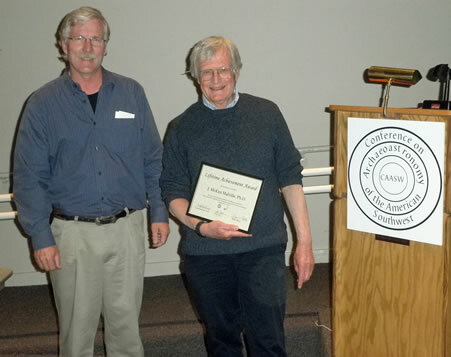 We are pleased to advise that Stephen McCluskey, PhD, Professor Emeritus, West Virginia University, was selected as the first recipient of the Distinguished Service in American Southwest Archaeoastronomy award. His work on Hopi sun watching practices and their calendar is a significant and distinguished contribution to the understanding of archaeoastronomy of the American Southwest. In addition, his involvement in professional astronomical organizations (Oxford Conferences, ISAAC, the American Astronomical Society Working Group on the Preservation of Astronomical Heritage) has greatly expanded the recognition and professionalism of the field of archaeoastronomy. The photo shows Dr. McCluskey (left) receiving the award from Conference Co-Chair Dr. Todd Bostwick (right).